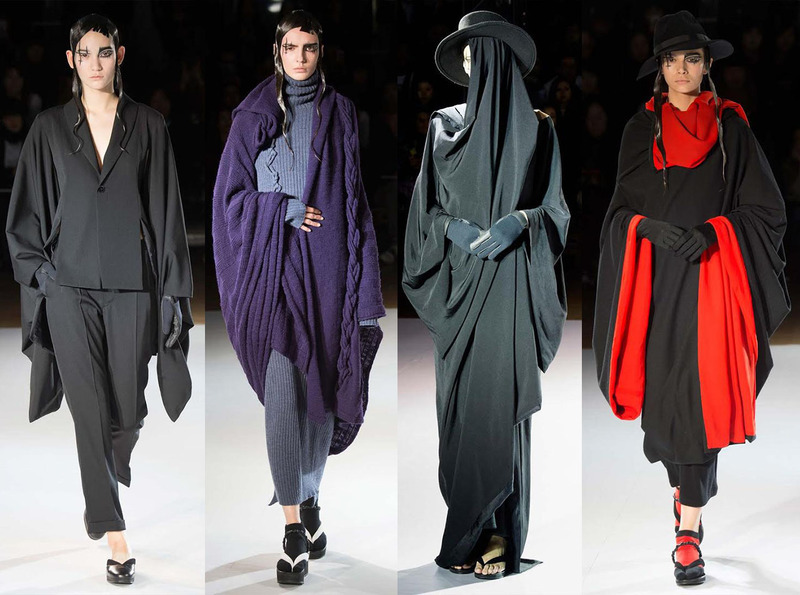 It’s difficult to articulate what makes Yohji Yamamoto’s clothes so cool. Maybe it’s the way he has ignored Western clothing’s traditional ideas of glamour and its typically accentuated points, creating clothes that are unstructured, relaxed, and durable, with a more abstract relationship to the body. Perhaps it is that the clothes can be both asymmetric and symmetric at the same time, designed to be seen at multiple angles. Or, it may be the layering, draping, and wrapping of the body to the point of androgyny that makes the clothes accessible and wearable. The relaxed fit, drop crotch, and signature black have made Yamamoto the key to being fat in fashion; before Lagerfeld’s ninety-pound weight loss, he was always seen in billowing black Yamamoto rayon. And though there has been a fair share of financial problems, there’s still Yamamoto’s partnership with Adidas, Y-3, to fall back on. See the full F/W 2015 collection here.